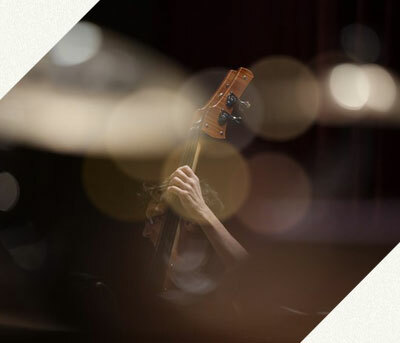 Robert Black tours the world creating unheard of music for the solo double bass, collaborating with the most adventurous composers, musicians, dancers, artists, actors, and technophiles from all walks of life. He is a founding and current member of the Bang On A Can All Stars and new member of Cuatro Puntos. Current projects include commissions from John Luther Adams (bass quartet), Swiss composer Marcel Zaes (bass trio), Natacha Diels (bass duet), Philip Glass (solo bass); and Possessed - a series of improvisations performed in Utah’s rugged canyon-desert landscape. Solo recordings include Possessed (Cantaloupe Records) Modern American Bass (New World Records), The Bass Music of Christian Wolff and Giacinto Scelsi (Mode Records), and State of the Bass (O.O. Discs). Robert teaches at the Hartt School/University of Hartford, the Manhattan School of Music, and recently the New Music on the Point Festival.